Earlier this week I lost a friend. Words on a screen telling me news that took my breath away, Lis had passed away. A few years back Lis and I worked together to build a web site for a baking group that she had co-founded called The Daring Bakers. Each month people from all over the world would get a recipe and they would all bake the same thing and post pictures and stories of how it had gone. It sounded remarkable to me, and it was. 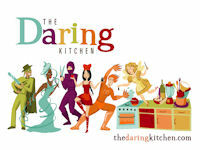 They wanted it to grow, wanted to add a cooking group as well ,and a few months later The Daring Kitchen was born. It was a big project, the largest site I had ever done, and over the course of the time and we eventually became friends and would chat and talk often. Lis was a woman I never met in person but I don’t think one could really interact with her without becoming a friend. If you spent time with her, or talked to her, got to know her, it just happened. Lots of things have changed since then, my life, her life, the group, the site, and while we eventually didn’t interact as often, as unfortunately happens, hearing of her passing has affected me deeply. She had big dreams, a sharp wit, a fantastic laugh, and she left us far too early. My most sincere condolences go out to her husband and her family, and the amazing number of people whose lives she touched. I think about the wonderful things that were created all around the world because of her, wonderful desserts and other food that was then shared with friends and family, new memories created, lives improved, all because of the virtual kitchen that she created and loved so much. I remember those dreams, Scott, and you helped her realize them. Life is definitely too short, but I have been thinking much these past few days about many things, not the least of which is that I don’t know I’ve ever known anyone whose spirit burned so intensely. I know she’s totally pissed off right now, will get over it, then realize the Universe is at her fingertips. Thank you for this — it is lovely. The blogging community has lost a very special lady. We all learned so much with a sense of style, humility and humour,and ALWAYS laughter and fun. Some of us may no longer be Daring Bakers but we are still those fledgling bloggers in spirit who rose to every challenge. Thank you Lis. Thanks so much for all the work you did to make The Daring Kitchen website happen. Lis was quite a special person, and we miss her, but her legacy lives on. And thank you for this tribute. G’day! Your quote made me cry just like seeing pretzels today too!